Featuring roller bearings (from the KBO4 up) and rope shackle attachment, the block is lighter and more compact. 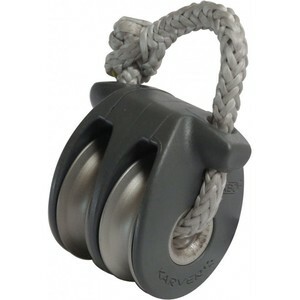 The KBO range is available in double and triple blocks with rope shackle attachments up to the KBO8. The use of soft attachments avoids metallic connections between blocks and allows for impressive weight savings. Purchase systems efficiency is achieved through low friction ball and roller bearings. Attachment through the centre still prevents the line from becoming disconnected from the lashing line should the block fail under extreme load.